The point here is about how simple is in our days to make a simple script as a programmer. I wanted to export my playlists ( 5 minutes .NET , Export Word Exce l PDF , EF 6 , Traceability ) videos into a simple HTML file that I could put into my website. I searched first on internet – however, I found just you tube google api . So I read the documentation (e.g. https://developers.google.com/youtube/v3/docs/videos/list) , grab a developer key from https://console.developers.google.com/ and made a simple project. Used also a NuGet package for JSON( Newtonsoft.Json) and one for export in Excel /Word /HTML / PDF /ODS (ExporterWordExcelPDF). Total time : 2 hours. You can find the project here https://github.com/ignatandrei/YouTube . It has only console application – but it will have soon a GUI . 1. “remember” their state – information that are read at the beginning, write at the end of the program . We will name those “local settings” because there are different by each user that uses the application. 2. Connect with other applications (databases, web services, other programs ) and remember the “connection” settings – information that is read and does not change often ( number of writes is minimized). We will name this “global settings”.Most of the time the writing is realized by setup and/or a new application dedicated to application administration. 4. how to make the information confidential. The saving can be done in two separate moments: on installing the application and in running the application. Usually, the global settings(information that does not change often such as database connection) is persisted on application setup and read when the application starts. The local settings information (such as last action of the user) is read when the application starts and it is write at the application end. ). The first one is for global settings, the other one for local user settings. We will enumerate here several methods, remaining for you the task to choose between the best. We will deliberately skip the method in which you use a file and you wrote information there in a proprietary format. 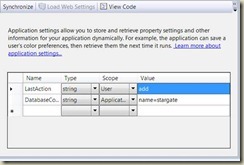 By default Visual Studio creates a class named “Settings” and puts code for retrieving/storing the settings that you create. More – the application settings does not have a “set” by default – it is normal since it is stored in application config file – an ordinary user cannot write this setting. Observation 1 : Please ensure you put in the app.config file file just global settings. Otherwise the application must have administrative rights to modify the app.config file. 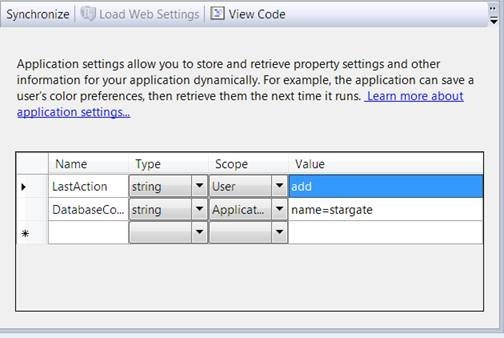 Observation 2 : For asp.net applications , the modifying of Web.config will result in restarting the application – that is NOT a good behaviour. This method is a combinations between method 2 and 3 : we have an intermediate class to save and we save in the config file . It is somewhat more to write about, but it is more safe – and can be modified and/or tested easily. This is the method with the more liberty. We can define any class we want to preserve properties – we just need to serialize the class. folder). More, for each desktop application please provide a way to edit the config file – and make sure you request elevated privileges. You will find tutorials about loading a combo box from database, loading a treeview from database and how to transmit data between windows forms. In this video we will test the Business Layer for a shortening application. The Data Access Layer is made with Entity Framework . Make a constructor on the form that has a parameter of the type you want to send. Do not forget the call to this( in order to execute InitializeComponent). Always verify on Load event that the copy of parameter is initialized.